Home / SURPLUS, military and civilian. / Tobacco pipe, finnish, 1945. Round base. Tobacco pipe, finnish, 1945. Round base. 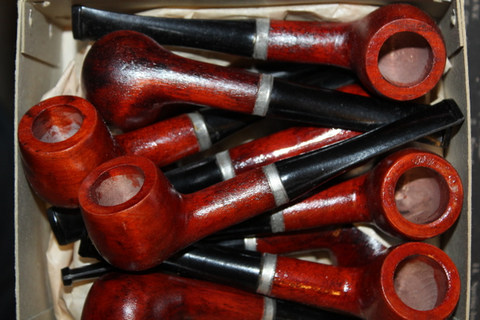 Original after war shortage time pipe, bowl is made of finnish "applewood" and bakelite stem, unissued. Thsese pipes were manufactured in october 1945, quality is fairly good for the times after the WW2. These round base models are more rustic compared to the hexagonal we also have in sale. Chamber: 17mm diameter, 22mm depth. Not for sale for persons under 18 years, your government may have issued some legislation about purchasing pipes, hastur.fi calims no responsibility for violations of local legislation outside Finland.